Effective communication in the geosciences requires consistent uses of stratigraphic nomenclature, especially divisions of geologic time. A geologic time scale is composed of standard stratigraphic divisions based on rock sequences and calibrated in years. Over the years, the development of new dating methods and refinement of previous ones have stimulated revisions to geologic time scales. 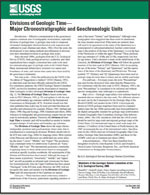 Since the mid-1990s, geologists from the U.S. Geological Survey (USGS), State geological surveys, academia, and other organizations have sought a consistent time scale to be used in communicating ages of geologic units in the United States. Many international debates have occurred over names and boundaries of units, and various time scales have been used by the geoscience community. For consistency purposes, the USGS Geologic Names Committee and the Association of American State Geologists developed Divisions of Geologic Time.